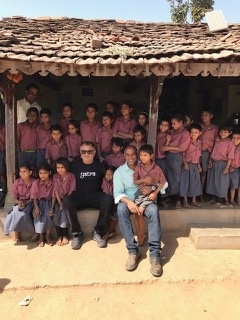 Sanjay and Ravi travelled to India from 5 to 12 March 2017 with the aim of visiting all our projects and monitoring their progress and meeting with our partners in education. It was a whirlwind tour, starting in the deserts of Rajasthan and ending in the coastal oasis of Cuddlelore in Tamil Nadu. In Sawai Madhopur, where we sponsor children in rural schools in partnership with GSK, we visited three of these schools. The first, Jaganpura, is the most established of these schools, and Sanjay sat in the daily teachers planning meeting where the focus was preparing our students to take their board exams for year 8. The curriculum is very detailed and revised every day after school, with teachers staying on until 5.30-6pm daily to complete these tasks. We also met with a group of young girls aged 14-17 years who are part of and adolescent girls program and who meet regularly to discuss different topics. All wanted to become teachers when asked, and it was apparent that their current teachers represent strong role models. Integrating sport into the curriculum has been an important part of Yatra Foundation’s contribution of these schools, and the strong culture of sport was evident by the fact the girls’ handball team has recently become State champions. We met with these girls (pictured below) and played soccer with the children, now a firm tradition! We next visited the Bodal school and also the new STEAM (Science, technology, engineering, arts, and mathematics) lab project. This project has established a working laboratory where students from all the GSK school can come and spend a day learning about the various disciplines by interaction, video presentations, experimentation and making their own gadgets (such as a solar powered fan-hat). This initiative has just been launched and two schools have already visited with more booked in for day visits. We also visited the neighbouring “Anganwaadi” (kindergarten/day care centre) being run by GSK, which was clean and well-organised with 35 children (aged 3-6 years) in attendance. The teacher spoke good English and explained that most of these children will be transitioned to the adjacent school once old enough, an excellent pipeline for this remote region. 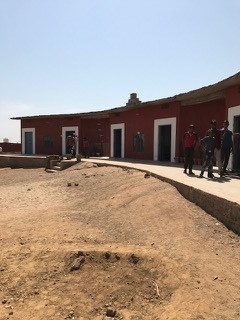 We also visited the Faria school where we have 120 children enrolled and were delighted to see that four of the new permanent classrooms have now been built, with the library and the remaining classrooms planned for construction in the near future. There are also now permanent boys’ and girls’ toilets and the sports fields are looking great. We were stuck by how far we have come in this school, as the first time we visited this site it was just a vacant block in the desert. That evening we met with the head teacher (Vishnu) and our community liaison (Radhashyam) and discussed our desire to develop more robust tools for measuring our impact and evaluating the progress of our students compared to government schools and State averages. We heard about the English initiative that is seeing eight teachers being up-skilled in English to enhance English teaching delivery and learning by our students. We also met with one of two Clinton Fellows from the United States, working at our schools who are looking at cultural issues and health initiatives implementation. We learnt that increasingly, our schools in this region are becoming “role model” schools for many government schools and our teachers continue to be imbedded within these schools to share teaching methods and curricula. We next travelled to Udaipur, where in partnership with Seva Mandir we support 20 SKs (learning centres), essentially single classroom schools (30-60 students) educating the local rural children to a level of competency and literacy where they can successfully transition to a government school. We visited one of our remote schools in Girwa block (an area spread out over 150km) where residents main subsistence is as farmers growing wheat crops for their own consumption. The classroom had 29 enrolled children with 28 present on the day, all looking well physically (ages 6-10). The school was actually a room in the teacher’s own house and he receives teacher training also. This was one of the SKs with poorer attendance previously, due to difficulty getting to this location and also teacher complacency. Attendance is now very good after intervention from Seva Mandir, and we also met girls now in year 11/12 who graduated from this very classroom and who now attend a government school 4km away. They catch a jeep in the morning to school (10 Rs/20 cents) and walk back as they can’t afford to pay for the return trip. These girls were aspiring to be teachers and to go onto tertiary education. We also met with graduates from our SKs, with some of these students studying engineering and business. Observations from students was that government schools “lack the love and affection” they experienced in our schools, and that they would benefit from a little more support once they leave the school including English language support and mentorship. They pointed out that they also have to juggle jobs with their studies, sometimes remotely from their villages. We will endeavour to meet with them regularly from now on to monitor their progress. We finally met with Priyanka, the amazing CEO of Seva Mandir. We discussed better evaluation of impact of our work, and how we should measure this and if/how we could offer extra support for students once they have graduated from our schools rather than throwing children back into a system that is “broken”. She was not sure of the answer but suggested that some pilot projects could be the best way forwards. We plan to develop these together. 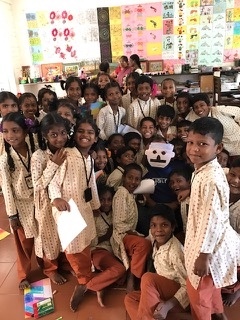 Our final visit was to the coastal school in Cuddlelore, where we support 150 students in partnership with Isha Vidhya. This school continues to amaze and inspire us, with students excelling in the state examinations and speaking fluent English. We met with a boy (whose father is an alcoholic) who explained HTML programming with us and had designed a website to welcome us! We then met three young girls who explained (in English) how to identify the composition of an unknown chemical compound by experiments and wanted to be a doctor, a teacher, and a musician respectively! One of these girls had obtained a score of 475/500 in the year 10 board exams – the highest in the region. This school continues to grow in size and excellence and will soon have the ability to educate children from lower kindergarten to Year 12, which will be a wonderful opportunity for our sponsored children. On our way back to Chennai, we met with the co-ordinator of this program, Vinod, and reconfirmed our commitment to this great school and program. Overall, our trip to India was moving, humbling, and inspiring as always and we were heartened to see how far we have come in the past 10 years. Our next challenges will be to develop effective strategies to monitor and evaluate our impact on our children and their lives, and to remain sustainable in the longterm. We look forward to this journey (this Yatra) with all of you!